Samhain and Ancestors Night are two religious observances that have a similar focus – honoring our ancestors and acknowledging the Mighty Dead. Food and drink is set out, photos are dusted off, and altar candles are lit. It’s a night of power, when the veil between the living and the dead is thinnest. Divinations for the new year are performed and festivals are held in honor of the gods. Although Samhain (or Ancestors Night) are not observed by all Pagans, Samhain is perhaps the best-known and most widely celebrated of the modern Pagan holidays. Who are these ancestors and Mighty Dead we honor? Our ancestors could be blood relatives of ours who have passed on. They may have been good people that we felt close to and loved all of our lives. Or they may have been not-so-good and we remember their lives as cautionary tales. Some Pagans include close friends or members of their coven or religious group who have passed on as their ancestors, saying they are the family they chose to have. The Mighty Dead are those practitioners of our religion who have crossed the Veil, but who still take great interest in those of their lineage. Or they may be relatives who were so kind, loving, and devoted to their family that some part of them stays on our side to continue caring for the family. They watch over us, guide us, and assist us. Which brings us to a very special place for honoring our ancestors and Mighty Dead year round. The Ancestor Shrine at the Sacred Paths Center. The shrine is simple and beautiful, brought into existence through necessity. Unlike Wisconsin, the Twin Cities has no Pagan cemetery or other public place for us to honor our dead. When Loui Pieper died, that lack was felt even more keenly. Enter Clarke Stone and Volkvhy Sterba, the two who are credited with constructing the actual shrine. They based the idea and the design off of traditional Shinto shrines in Japan. The shrine has been built without any metal pieces in it. Not a single nail or screw has been used, only wooden pegs and glue. Pagans are encouraged to leave offerings at the shrine. Typical offerings are liquor, flowers, incense, and food. 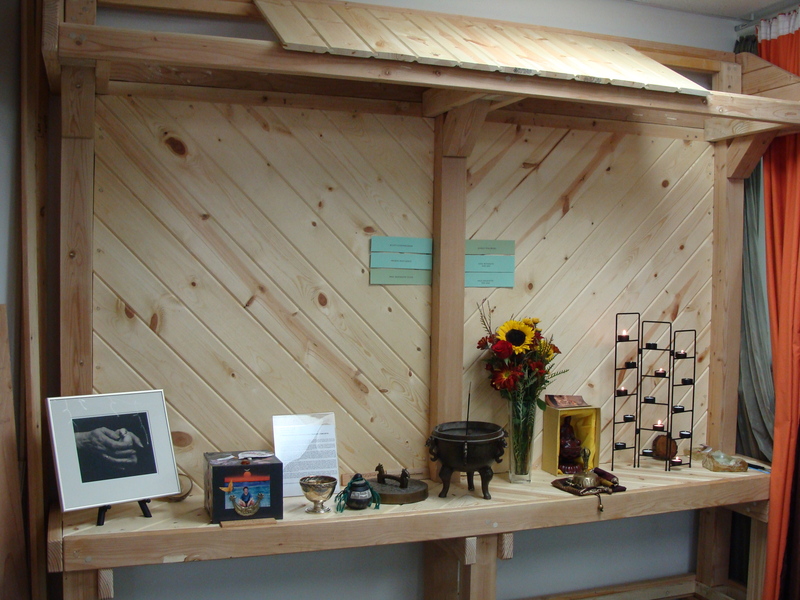 The Sacred Paths Center keeps a supply of incense and tealights on hand for use at the altar. The SPC also accepts donations of money. The money is used to keep the shrine clean and to keep the vases filled with fresh flowers. In addition to the items on the top of the altar, wooden plaques will soon adorn the shrine. The plaques are approximately two inches by 6 inches and are laser engraved oak. If someone wants to have a name added to the shrine, they simply make the request and give a donation of at least $20. A full form is available on the SPC website and it walks you through the entire process of creating your plaque. 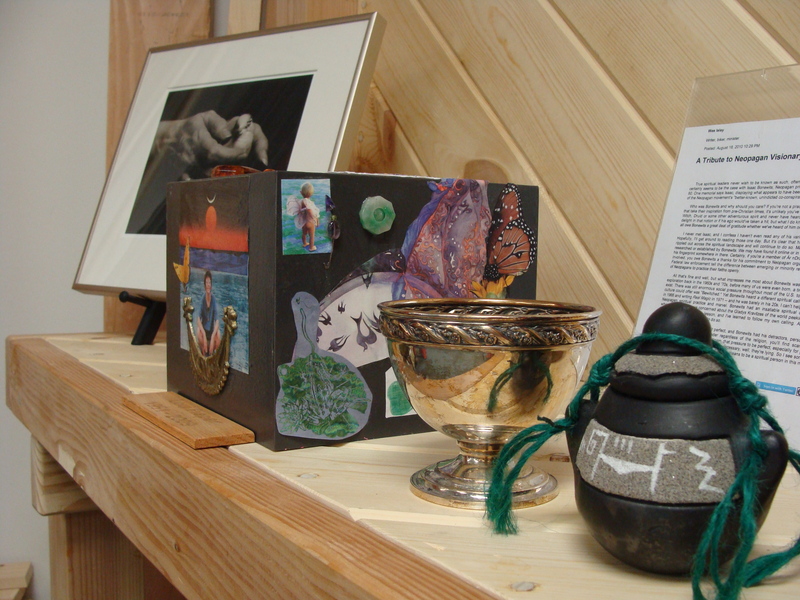 If you are interested in visiting the shrine for Samhain or Ancestors Night the SPC is open on Sunday from 10 am to 4pm. You’ll be in good company as the Center says that they have been getting more visitors than usual to the shrine in the past few days. The Wiccan Church of MN is having their public Samhain ritual at the shrine tonight at 6:30 to 7:30. This ritual is open to the public. Ancestors, Blessed Ancestors, we’re calling you today for healing. We thank you for the strength you showed while you were here, the sufferings you endured and the love you gave to your children. And now we call to you: we are your sons and daughters, sons and daughters calling to you. Through the mists of time, we stretch out our hands to greet you with joy and ask for your help today, in a healing way. Blessed Ancestors, please help us, heal us, guide us, lead us on our paths into the future, where we will meet the Descendants yet to come, those as yet unmanifest, waiting to arrive, waiting to be alive, we call to you. Blessed Ancestors from the past, blessed Descendants yet to come, look on us with compassion here, and make this moment a time of true healing, a gift from the past, a gift from the future, to heal us now. We welcome you!